Before any lighting installations are carried out in bathrooms it is essential to understand the significance of bathroom zones, as set out in the electrical safety regulations. These bathroom zones are designed to ensure that only bathroom lights provided with appropriate protection are used, especially within the higher risk areas so that the risk of electrocution is avoided. Like other electrical equipment, light fittings are given an IP Rating to indicate their suitability for a particular environment. IP stands for ingress protection and the rating consists of the letters IP followed by a two digit number. The first number indicates the level of protection provided against intrusion by extraneous objects, dust etc. The second digit indicates the level of waterproofing. For a more in-depth explanation of IP Ratings take a look at our definitive guide to IP Ratings. 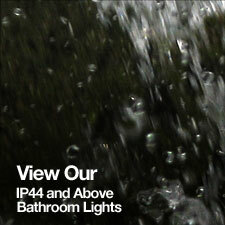 In the case of bathroom lighting installations, the principle hazard is of course water. It is well known that electricity and water do not mix well! For anyone responsible for people’s safety it is vital to keep those two apart. However electrical safety can be greatly aided by using equipment operating on a low voltage and this is recognized in the bathroom zones requirements. Bathroom zones are best described with reference to illustrations but the measurements stated are quite specific and must be adhered to. What follows should help with understanding what grade of fittings can be placed in the different bathroom zones and the reasons why. It is only a guide and such work should always be carried out by a qualified electrician who will be conversant with the IEE Wiring Regulations (17th Edition). As you can see the illustration below shows a bath, wash basin and a stand-alone shower installation. If any of them are combined or their respective zones overlap then the higher risk level should be applied. As you can see the illustrations show four distinct bathroom zones, 0, 1, 2 and 3 (referred to in the key as “Outside Zones"). Zone 0 is inside the bath or the shower tray itself. If lighting is required in there, any fitting used must use a low voltage supply, that is a maximum of 12v and also be rated at least IPx7 which means it is totally immersion proof. 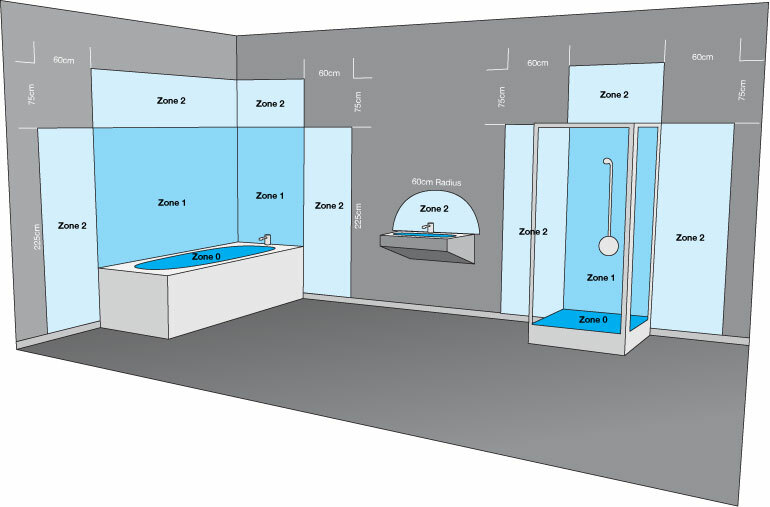 Zone 1 is the area above the bath or shower tray to a height of 2.25m from the floor. Any fitting used in this zone must have a minimum rating of IPx4* , which means it is protected against water spray from all directions. If the fitting uses a 240v supply, a 30ma residual current device (RCD) must also be used to protect the circuit in this zone. Zone 3 is anywhere outside zones 0,1 and 2 (subject to specific limits) and where no water jet is likely to be used. No IP rating* is required in these areas. *If there is any likelihood of water jets ever being used for cleaning purpose in Zones 1,2 and Outside Zones, fittings rated a minimum IPx5 must be used which tells you that the fitting is protected against water jets. The latest edition of the IEE wiring Regulations will provide more detailed information but your electrician should be fully up to date with these. When it comes to selecting the actual fittings to go into the different bathroom zones there are plenty to choose from. To help you in your search for the ideal bathroom lights, we have put together a constantly updated top 10 bathroom lights showcase. In this useful feature we identify the bestselling bathroom lights and helpfully identify whereabouts in the bathroom they can be safely positioned. The information provided in this guide should help you to understand the requirements for bathroom lighting and the meaning of bathroom zones. When you discuss your requirements with your electrician you should now feel able to do so with greater confidence than you may have felt before. 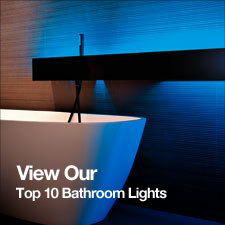 Why not take a look at our full range of bathroom lighting? 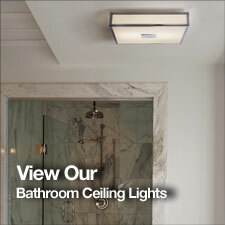 For more inspiration and advice try our Lighting Advice section.